Yes, we have a variety of dog figurines that just might make a perfect stocking stuffer for a special person on your list. The big wooden dog is looking for a friendly home. Front left is a cute Scottie Dog planter. The pink spaghetti Poodle refers to the process used to make the ‘poodle’ effect. Behind her is a Springer Spaniel made in Japan, and next to it is a cute little Chihuahua. Right front is a plaster ‘nodder dog’ from the 1960s – remember when we used to have them sit on the dash or in a back window. 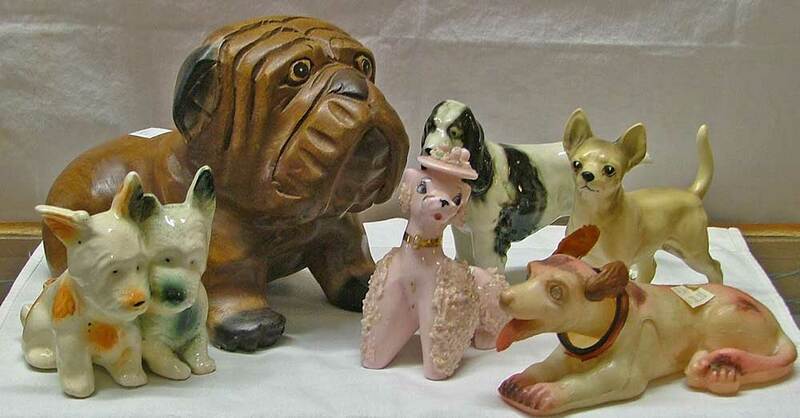 Yep, we have a wide variety of dog figurines throughout the store. Stop in and browse for yourself. Ask us, we can help point them out to you. We’ll be watchin’ for ya!